While looking up the archives of my e-mail, I discovered this story that I e-mailed to my cousin in the United States. Whether I wrote it, or read something like it elsewhere, I cannot vouch for. If it has another author, and the story was told in a different way or language, please let me know. Once upon a time in a kingdom called Uper-ka-desh far far away, a beautiful, independent-minded, self-assured princess sat pensively on the bank of a lotus pond behind her palace. Her father had warned her not to go out of the palace and not, in any case, be seen in the company of men. The killings, rapes, corruption and police brutality regularly happening in the Kingdom worried her no end. She was sad that the king, her father, laughed at the terrible reports that were presented to him at the royal Durbar. On many nights, she sat crying on the queen’s lap when the king had gone visiting another house in his harem. “What can we women do,” her mother retorted in desperation. That night the princess couldn’t sleep till four-thirty in the morning. She lay shuddering at the very thought of the poor girl with pulped-up face. Then she dozed off for a few minutes, and woke up with a start in the middle of a terrible nightmare. Her mother, the queen, had already woken up and gone on her chores. “Who are you talking to, princess?” asked a squeaky voice. A fat frog with pearl-like eyes and golden skin was staring at her. Just as she found the source of the strange voice, the frog hop-hopped and landed in her lap. “Who the f…” and the princess recalled her mother’s advice that profanity did not become a princess. The frog made a sound that was like a sad giggle. She picked him up to take a closer look. 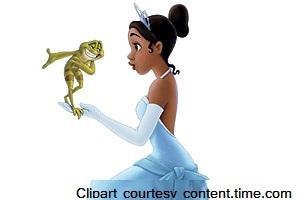 The princess stared at the frog. So what her nanny had once told her that all frogs were once princes was true. Here was a living proof. The princess sat and stared, wondering if it was another nightmare. “You should know what is next. The princess takes me to her room and gives me half of her bed, and kisses me, and I turn into the original brave and handsome prince that I was”.